The first beta weekend event for The Secret World kicks off today, giving countless players their first tantalizing taste of Funcom's modern day massively multiplayer paranormal role-playing game, but there are tales of a hidden server — a server where members of the gaming press have had days to explore the dark corners of the world. These tales are true. I am living proof. And though it may break the code of the brotherhood I've been pledged to — the secrets I share now could tip the delicate balance of world power — I am first and foremost a reporter. Perhaps the so-called Illuminati will learn an important lesson here as well: never invite a member of the press to join a secret society. It's as if mysterious forces aligned against me were keeping me from getting my hands on The Secret World. I've spent ages waiting for my chance to get my hands on Funcom's mysterious MMO, only to have countless obstacles thrown in my path. Well, two tiny, crawling, crying obstacles to be exact. I'm not saying the shadow government impregnated my wife on the sly as part of a grand conspiracy to keep me from learning the truth, but I wouldn't put it past them. So while the intrepid Kate Cox got to try her hand, my hand has remain untried, until now. The press beta for The Secret World, a completely different entity from the public beta launching this weekend, kicked off on Tuesday, and while I've only managed to spend three or four hours playing, I've managed to learn quite a lot, not just about the game, but about myself as well. Character creation isn't just a precursor to the main event for me; it's a game-defining moment. Character creation is my opportunity to inject myself into a massively multiplayer game, adding my own unique flavor to a world defined by other people. I've been known to spend hours honing my look before entering a game, adjusting every slider, tweaking every style, and getting the colors just right before taking my first steps in a fresh game. In its current form, The Secret World's character creation doesn't afford me much of an opportunity to indulge. There are no sliders, no real intricacy. It's all a series of pre-generated features. Select a face, choose a hairstyle, tweak the nose, mouth, eyes and jaw, and you're off to the races. There are no size sliders and everyone shares the same basic body shape. Quite frankly, this is not good enough for me. Hopefully it is still being fleshed out, so-to-speak, but as of right now my character looks generic, and if I look generic, I can't help but feel it too. 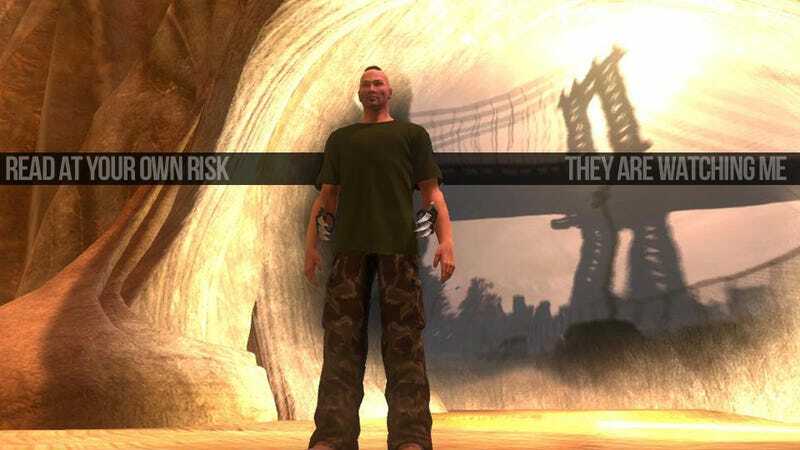 Since my earliest impressions of The Secret World back in 2009, I've known exactly which of the game's three secret societies I wanted to play. The Templar were too militaristic, the Illuminati too full of themselves. No, I was a Dragon, the mysterious clan of chaotic manipulators, pulling strings from their mysterious base hidden somewhere among the streets of Seoul, Korea. The Secret World: Which Side Are You On? I have Dragon stickers, Dragon pins; every time I log into the game's website I am reminded that, in no uncertain terms, I belong to the Dragon. And they aren't playable in the press beta yet. Dammit. So instead I went with the Illuminati, the New York based party animals, reveling in the tremendous power their knowledge of the world's secrets brings. My character came to life in the middle of New York City, where a brief encounter in a Laundromat led him into the sewers, a stinking rabbit hole from which there was no return. When I discovered the Illuminati's underground lair, my character was sedated and indoctrinated, his combat abilities tested by placing him in the driver's seat of another member during a particularly harrowing encounter with shadow creatures in the city's subway tunnels. Once I awoke I was given my choice of weapons (Chaos Focus, a nod to my true allegiance) and got a chance to meet my handler and learn a little more about what I was getting myself into. After that I was sent directly to the Lovecraftian New England town of Kingsmouth, utilizing the secret pathways underneath the surface of the planet to travel several hundred miles nearly instantaneously. In this fog-covered, zombie-infested hellhole it didn't really matter which society I belong to. All that mattered was survival. First off, I apologize for the random content of this content clip. My video capture software zigged when it should have captured video, so it doesn't quite capture the point I am trying to get across with this particular lesson learned. And that lesson is that I may have outgrown floaty MMO-combat where it never really feels like I'm truly connecting with the creature I'm killing. In Kingsmouth I encountered hordes of zombies, charging me four at a time and flailing almost comically at my character as I pressed buttons to activate my skills, causing me to flail colorfully back. While I could tell by the health bars that I was doing damage to my undead foes, my strikes and special attacks lacked a certain weight. Perhaps I'm just spoiled. Stupid Tera. Running through the woods of Kingsmouth, moonlight filtering through the trees and fog as guttural growls sing my doom from somewhere just out of sight; this is exactly the experience I was hoping for. I can forgive a great deal in a massively multiplayer game if it actually manages to frighten me, something The Secret World seems to have no problem with at all. It's a combination of lighting, setting, sound design and musical cues. It's also a matter of game design. Many of today's more casual-friendly MMO games like to group like-leveled creatures into a certain area, giving the player a defined space where they can handle anything thrown at them. That's not something you can rely on in The Secret World. Take a wrong turn, and it could become an extremely wrong turn. It's doing a number on my nerves. That's a good thing. Seriously, just look at that. It's completely dense and not particularly friendly for the MMO novice, but for someone that's been playing these things for more than a decade, this is something fresh and new. You're probably confused. I was too. Most other MMO games lean towards a more intuitive interface. An interface you can look at and know exactly what's what. Not The Secret World. This interface is a slick and seductive beast, filled with stats and secrets I can't wait to become more familiar with. After a few more weeks I'm sure it'll become second nature, but for now it's a pleasantly alien thing that surprises and delights me every time I see it. Most MMO games rely on floating text boxes to relay important information to the player. Funcom does this instead. Police reports, telephone books, cellphone pictures; all this and more rendered as actual graphics instead of simple text description. This is a glorious thing. Seriously. Visual cues like this have been a staple of adventure gaming for decades. It's about time the made it into an MMO. Oh, the joyous freedom of writing for a game that takes place in the modern day and utilizes conversation patterns from real people instead of fantasy archetypes. Though leaning a bit heavily on American stereotypes (I'm looking at you, small-town sheriff), The Secret World's dialogue thus far has been a profanity-peppered delight. I don't want to spoil anything for those eager to get into the game themselves, so I'll just say keep your speakers turned up or keep the subtitles rolling, you're in for a treat. Within the span of a few hours The Secret World has managed to frustrate, confuse, terrify and delight me. Its simple character creation put me off, but its real world foundation and excellent atmosphere drew me right back in. Combat left me cold, but the unfolding mystery of a horror-infested New England town kept me fighting. I'll spend the next few weeks delving deeper, so be on the lookout for more clandestine information. Just don't tell the Illuminati.